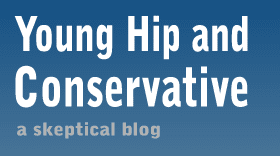 Young, Hip and Conservative: a skeptical blog: Does being wrong make someone stupid? There's a strain of arguments surfacing today that attempt to prove a point not with logic or reason, but simply by saying that people who agree with the position are smarter than their opponents. The argument takes a lot of forms. There's the phony claim that Democratic-majority states have higher average IQs than Republican states. There's the recent study that concluded that liberals and atheists are smarter. This study met a lot of harsh criticism. There are also reports that going to college makes people more liberal, and college professors themselves are overwhelmingly liberal. Surely, this must all add up to an endorsement of liberal positions. If the smart, educated people are more liberal, than liberalism must be the superior position, right? Not so fast. Let's keep in mind the relevance of expertise. A doctorate in chemical engineering does little to prepare someone to evaluate the consequences of an inheritance tax. An education major will learn how to teach public education students, but not the ins and outs of school funding. Some fields, like womens studies, don't seem to do anything but train left-wing activists. Paul Krugman wrote that most intellectuals fail to understand comparative advantage, so how informed can their economic views be? So a generic degree will teach people some important things, but not necessarily anything relevant to political positions. The popular explanation for college liberalism from the right is that colleges brainwash students into being lefties. I imagine there is some truth to this claim, as a constant exposure to mostly one side of an argument should skew things to some degree. However, it's incomplete. Are we to believe that the students who eventually become left wing professors are never motivated to question these lessons once they graduate? Doesn't that suggest that the end game knowledge simply confirms their liberal upbringing? There must be more going on than simple brainwashing. Hayek had several answers to this problem. His first is that smart people prefer top-down solutions because they believe they could fix societal problems if they were put in a position of power. The rub is that there's a lot of other smart people who think their narrow field is important, and when you add up all the intellectuals and all their solutions, your pool of resources is too small to satisfy them all. Each expert thinks his cause would be bumped to the front of the list, so they all support a centrally-planned system that would be doomed to failure if attempted. Flash back to high school when my history teacher told us that Plato believed the world should be ruled by philosophizer kings. I rolled my eyes because this was clearly a self-serving solution - a philosopher saying philosophers should be in charge. Smart people don't want to have to compete for wealth; they think they deserve it more than simple-minded people. So our world is infuriating because someone of average intelligence can own a construction company and make more money than a scholar. Academia itself is a top-down approach. Although I constantly read about professors frustrated with academia, they may prefer the system simply because they are familiar with it and being a professors means the system already worked to their benefit. Does being right make someone smart? But outside of higher education; is there a cause-and effect relationship to intelligence and being correct on a given issue? Keep in mind the right wing isn't afraid to make these kind of arguments either. Ann Coulter's 2007 book was titled, If Democrats Had Any Brains, They'd Be Republicans. I sometimes stop myself from accidentally calling people stupid when they express stupid ideas. This isn't just out of respect - it's entirely self-serving. In 2006 I wrote an editorial in my college newspaper defending Intelligent Design as an alternative explanation to evolution, and calling on biologists to give it a fair shot instead of dismissing it out of hand. I got a few replies from the biology department which said that yes, these claims have indeed been addressed - back in the 19th century. By 2007 I was no longer an Intelligent Design proponent and rejoined the evolution camp. Did my complete reversal on that subject mean I went from being stupid to smart within a year? I certainly hope not. Most of my other positions went unchanged, and I retained a lot of knowledge in other subjects. It's ideas that can be easily diagnosed as stupid, not the complex people who hold them. I firmly believe that Sept. 11 conspiracy theories that say the government orchestrated the attacks are moronic, but some of the people who hold them can still be smart. I think the anti-vaccination crowd is very ignorant about vaccines, but capable of being smart in other subjects. Don't get me wrong, people can still be stupid. It's just hard to tell if someone is stupid because of their views on one subject, no matter how strongly they hold them. In addition, there is no reason someone of low intelligence would be unable to stumble upon a correct viewpoint. Keep in mind that saying being smart and being right are the same thing suggests people generally select their positions on a given issue using reason and logic. That view ignores the widespread problem of rationalization - where people based their decisions on emotions and then cook up an intelligent explanation for why they hold that view. It isn't always just a matter of individual issues. For many, it's a syndrome. They don't just reject evolution due to poor biology lessons; they reject a whole slew of things, often seemingly just for the sake of blindly promoting ideology: cloning, vaccines, physics, global warming, etc. I think there are some people who are genuinely stupid and that should be derived from a pattern of behavior. Sarah Palin isn't a very intelligent person as we can tell from her speeches, interviews, hand scribbled notes of triviality, and her general lack of common sense/knowledge. On the other hand, Bill O'Reilly's pattern doesn't show the same inanity. He's able to actually engage issues on an intellectual level despite sharing a number of views with Palin. I wouldn't really call those beliefs a syndrome because they share a common cause - it's more of a rejection of one valid form of evidence. There are different forms of intelligence, and not understanding the importance of the scientific method is a poor position to take - but not a medical condition. There are a lot of anti-science view that stem from demonizing the pharmaceutical companies - alternative medicine, anti-vaccination etc. My entire point was holding this view, which is wrong, doesn't make the entire person stupid. Perhaps "ignorant" is the better word to be used in such situations. But that doesn't mean we ought to do away with blunt force terms such as "stupid". After all, a person may be educatable, even sometimes educated, but what matters is how any given information is transformed into knowledge. I think you've missed my central point. It's a lot easier to diagnose an idea as stupid than a person. Ignorance works in some cases, but not all of them. Some people have heard the right side of an issue and still reject it. I can certainly attest to the brainwashing - having been thoroughly brainwashed myself in both high school and college. College proves that smart people are just as susceptible to groupthink as stupid people, if not more so. The "smart kids" in school emulate their teachers, who have (in the humanities at any rate, nearly to a man) mistaken repudiation of America for intellectual inquiry.